If you’re looking for a dining experience and not just another meal, you need to head over to Cowboy Jack&apos;s in River Prairie! Jack’s offers a variety of signature drinks and I recommend the Backroads High Ball. This whiskey drink is perfect for the patio as it’s mixed with ginger ale and a lime wedge. Enjoy it while taking in the view and keep those warm, summer feelings! 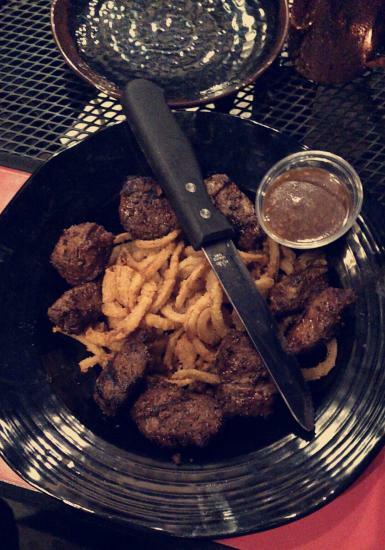 Try the sirloin tips! This is a menu favorite of the staff at Jacks. With gluten friendly and under 550 calorie versions, this will please any diner! The signature dry rub gives the tips a light kick while the chili garlic sauce is bursting with flavor. Cooked to order, this is a can’t miss! By far, the best menu item is the Baby Back Ribs! These slow-cooked ribs are drenched in Jack’s signature BBQ sauce and fall-off-the-bone delicious! Add Jack’s thick lasso fries and you’re almost guaranteed a great lunch for tomorrow! After this delectable dinner, satisfy your sweet tooth with mini donuts. Yup, you heard that right! Just like the state fair fare, these mini donuts are a lighter finish to a heavy meal. The cinnamon sugar was the exclamation point on an excellent meal. Whether you’re there with friends, bringing the family out on the town, or catching the big game, Cowboy Jack’s offers a great meal, at a reasonable price, with a great atmosphere. Jack’s lives up to their mission to be nutritionally conscious and served fresh. This will quickly become one of your favorite local spots.